According to the British news media, the turf war began when Larry tried to infiltrate the grounds of the Foreign Office from his nearby Downing Street residence, prompting a jealous Palmerston to claw at him. LONDON — Britain’s new leader had been in office barely a week when a skirmish broke out between 10 Downing Street and the Foreign Office. No, Prime Minister Theresa May’s patience with her boisterous foreign secretary, Boris Johnson, did not run out. Instead, a fight erupted between Larry the Cat, 10 Downing Street’s tabby, and Palmerston, the Foreign Office’s feline. 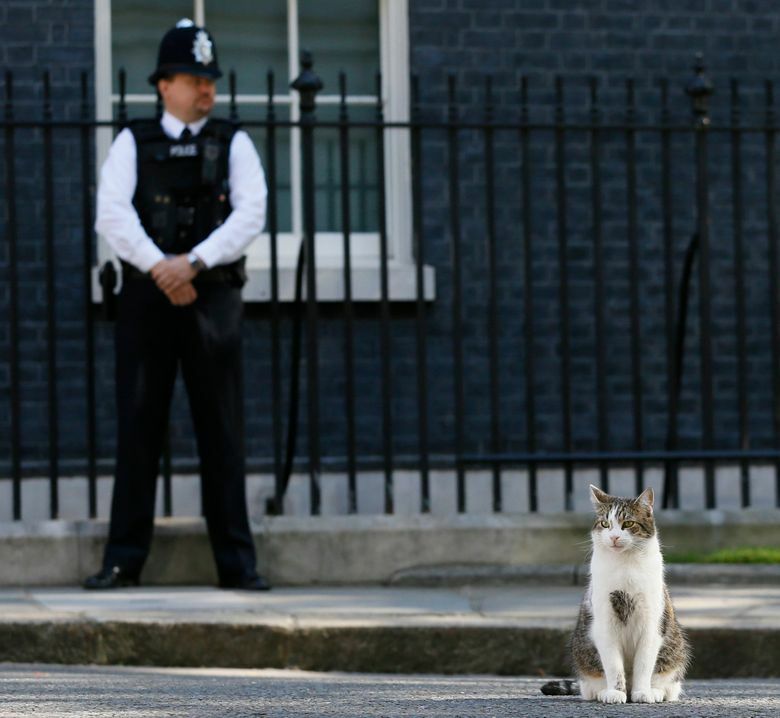 Larry, who holds the jocular title of chief mouser to the Cabinet Office, after being tasked in 2011 with alleviating a mouse problem at the prime minister’s residence, was recently spotted with a limp. Palmerston, however, is a newcomer, having arrived in April. According to accounts in the British news media, the turf war began when Larry tried to infiltrate the grounds of the Foreign Office, on Whitehall, from his nearby Downing Street residence, prompting a jealous Palmerston to claw at him. Eventually, Larry emerged triumphant, and he limped home. A spokesman for 10 Downing Street, speaking on the condition of anonymity, confirmed Friday that Larry had been treated by a veterinarian after being injured. But he declined to elaborate on whether Palmerston was behind it. “He has been treated and expected to make a full recovery,” the spokesman said. Such is the concern over Larry’s health that Ann Clwyd, a Welsh lawmaker from the opposition Labour Party, raised the issue this week in Parliament, saying the cat looked in a “very sorry situation,” and had been seen limping with one paw in the air. “Is it because he’s missing the old prime minister, and does the new prime minister care for the welfare of cats as much as the old prime minister did?” she asked. The new leader of the House of Commons, David Lidington, who until recently was a minister of state at the Foreign Office, expressed hope of detente, if not of rapprochement, between the rival felines, saying, “I hope that they have now established a modus vivendi.” Journalists asked about Larry’s health at a news briefing given by the prime minister’s office in the House of Commons on Thursday. May is the first prime minister since Lord Palmerston to move directly from the position of home secretary, which she had held since 2010, to 10 Downing Street. Today’s Palmerston could perhaps be forgiven for being combative, given the diplomatic missteps of his boss, Johnson, a former mayor of London and a prolific author and journalist.